The future is here! You can be sitting in your living room in Japan and have a private English lesson with a teacher in New York. If you’ve been a part of recent educational traditions in any capacity, you likely know how the process usually goes. There’s one teacher, somewhere between 15-30 students, classes seem to drag on with only a break or two (if that!). Education systems have run this way for centuries, and few will say that this is an unsuccessful model. Nevertheless, nobody can deny the impact that technology has had on all walks of life—especially education! While students in a classroom with only one teacher have to compete for her time, attention, and useful feedback, the internet offers students the opportunity to have a one-on-one relationship with teachers and get the attention they deserve. How is online education relevant to older generations? This inquiry is a very good one because it isn’t always easy to incorporate values and traditions from the past in order to demonstrate that older folks can still benefit from it. Many older folks are put off because they think the costs are higher. However, this sort of individualized education is worth every penny. Students are paying for their educations rather than giving their locals schools money to be bored or listen to classmates talk and/or be disruptive. Will I miss the face to face interaction of a classroom? It is a lot to get used to, admittedly. However, lessons occurring on video chat transpire immediately and easily mimic what many have experienced in the classroom. When speaking only to the teacher, students will not be able to easily get off track. Both the teacher and the student will be able to focus on the material at hand and clarify any information that might be difficult to grasp immediately. Working in an online setting gives students the opportunity to have constant access to their work from various locations. Gone are the days of textbooks and your dog eating your homework. In today’s world, you can’t possibly leave assignments behind because they’ll all be online 24/7. Students, who often have to take on multiple responsibilities throughout their busy lives, find online course to be a breath of fresh air. They are not bound by space or time limitations and are happier people for it! The debate regarding online vs. physical classrooms will probably still be going on for quite some time. However, many educational programs are adding on online components to meet the needs of their student population. More and more people are finding online classes to be agreeable and less time consuming. Students want the easy access that they experience in various other avenues of their life. Student appreciate being able to stay up-to-date with their classes and receiving text, emails, and video chats when their work is not up to par. There is a place for all people in the realm of online education. If you are skeptical about online education, contact SkypEnglish4U and we’ll answer any questions you may have. If you are going to be a great English speaker, you must not underestimate the most important feature of the language: the words! Grammatical correctness and sentence structure are important, but without knowing actual English vocabulary, success with these skills will be irrelevant. When you gain knowledge of words in English, you will be able to state your thoughts, emotions, and opinions accurately. Enhancing your vocabulary won’t be easy—especially if you don’t live in a country where English is the common tongue. You will be less likely to come into contact with English words throughout the course of your day. Luckily for you, you will have the chance to succeed by taking just a few moments of your day to learn new words. By practicing the following advice, you’re likely to see significant improvements every week. In order to be a successful English speaker, you will need to practice reading in English. The very best students of the English language are those who appreciate English literature. They make the effort to read a significant amount in English every week in various topics. Now we know: you’re a busy person! You likely have a career, children, and other activities that add to your life. However, by taking as like as 30 minutes per day to practice reading English works, you are for more likely to succeed in you goal to be a good English speaker. This doesn’t mean that you have to run out and and read the entire works of Shakespeare. Rather, you should choose to read about something you’re interested in. If you like sports, read an English article about your favorite athlete. If you love to read social media updates, change the settings on your computer to English and go about your normal browsing. 30 minutes isn’t a long portion of your day to dedicate to your English language study, and you’ll likely see improvements immediately! When you come across new and interesting English words, it might be your first instinct to say “I’ll stick to the words I know.” While this is an understandable mindset, successful English speakers are more inclined to step outside of the box. When you find English words that you don’t know, make an effort to write them down, look them up in the dictionary, speak them, and write them. Dedicate around 20 minutes per day going over the new words you learned that week and commit to using those words in conversation at least three or four days a week. Working with your online ESL teacher, you will soon learn how to use each word in context and gain mastery over all of the English vocabulary you’ve been working on. These are only a couple of strategies that will help you to increase your vocabulary in the English language. Try them out and see how they work for you. If you’re looking for more strategies, contact me and I will be happy to help you develop a vocabulary plan that will work for you. The TOEFL exam (Test of English as a Foreign Language) is a very popular English proficiency exam taken by people from around the world. Most of the TOEFL students I have worked with have needed the test for their university application. Others have had to show a potential employer an official test score to prove what their English level is. The TOEFL iBT (Internet Based Test) is done fully on a computer and measures your ability to use and understand English at the university level. If you are planning to study abroad, it is important to check with the school and find out which exam you need because different programs have different requirements. The TOEFL exam has 4 parts – listening, reading, speaking, and writing. There are endless resources online for TOEFL, books, pdfs and all sorts of things that you can pay for to help you prepare for this exam. Every student learns differently, some are more book oriented, while others need a more hands on approach. Regardless of which type you are, you need to practice what you will do during the actual exam. No E-Book can correct your essay or give you feedback on your speaking. Some students only prepare for the exam and don’t focus on improving their general English. If you are taking the exam to get into a University in the USA, you are going to need English once you get there, so if you just focus on TOEFL practice questions, that isn’t really going to help you in the long run. During my sessions with TOEFL students, we focus on the speaking part of the exam and some people also want to work on their writing skills. Any and all speaking that you do before the exam will help you, so general conversation and small talk are also part of preparing for the big day. There are 6 different parts to the TOEFL speaking exam, some of which integrate reading and listening as well. I focus on the first 2 sections and will go through actual exam questions with students while using the time regulations from the exam – 15 seconds to prepare, 45 seconds to answer. It is not a lot of time and many students find it difficult to answer in such a short time. The more you do it, the easier it gets. We will go over many different possible exam questions and make sure that you are comfortable with the question format and the time limits. Doing the speaking practice out loud is a very important part of preparing for the exam. On the test day, you will be sitting in front of a computer and when it tells you to start, you have to start. Some students find speaking to a computer more difficult than speaking with a person and others have the opposite opinion. Regardless of your stance on this, you are going to have to speak- so it is a good idea to practice it with someone who can give you feedback. If TOEFL writing is something that you are interested in practicing, I will send you the topic before our session and you write the essay on your own time and then we review it together using Google Documents (if you can not access this in your country, there are other ways to do it). Using this ‘reviewing/editing together’ process, you will really see quick results. Doing it this way is an active learning process as opposed to if you just send your document to someone and they correct it. Then YOU are not a part of the reviewing process. It is much better to be actively involved and be able to ask questions and discuss the changes we are making. Writing is an active process. You are using your knowledge to create something. Many students don’t practice writing essays enough because they think since they can read well and understand most things, that then they can write a proper essay. Another common mistake that students make is to not practice writing with the time you are allowed during the test. I suggest that students start to practice writing with no time limit and once they start to feel comfortable with the essay format, start to keep track of the time. The TOEFL Ibt is the lovely product of technology, so there is no way to know what type of questions you are going to be asked. You can thank the programmers behind the scene for the algorithm they have developed. You need to be ready to speak about anything and everything (not just the practice questions from a TOEFL prep book). I’m going to start using a new hashtag on Twitter that encourages student participation. That means YOU! 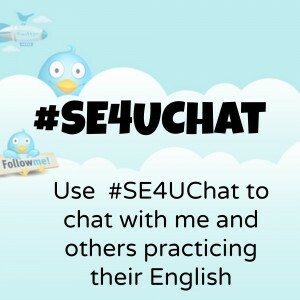 I will use the tag #SE4UChat for any interactive tweets. When you hit reply, make sure to use the same tag and I will always see it and respond. Hopefully others will as well! Twitter is a great place to practice your English. In this article > English on Twitter, I list popular hashtags used by English teachers and students to communicate on Twitter. Hashtags are a great way to find exactly what you are looking for. 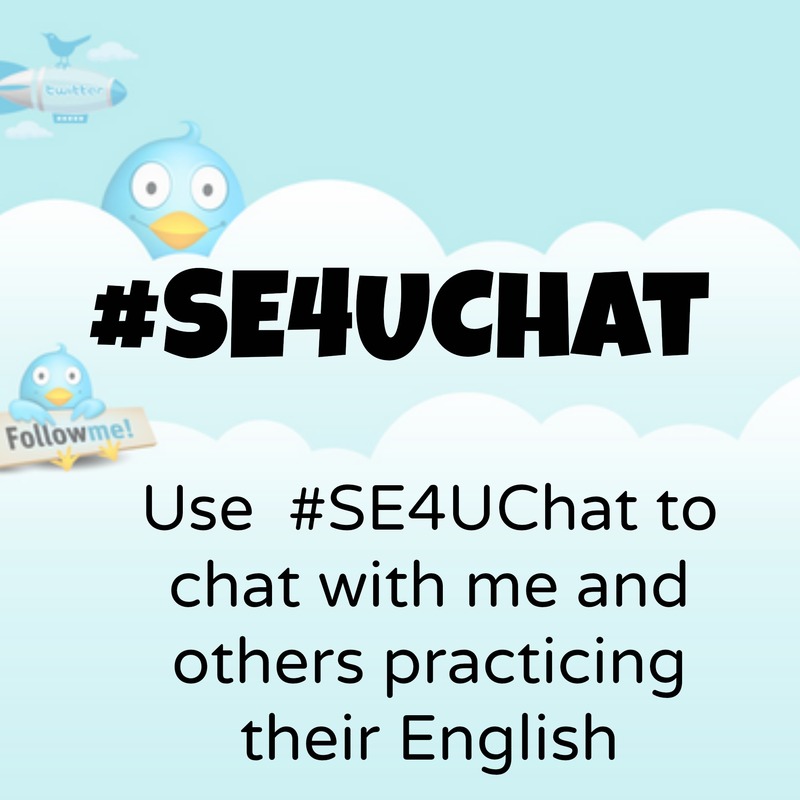 If you are looking to chat, use #SE4UChat and I’ll get back to you as soon as possible. Follow people and topics that interest you and read the links they share in English. This will help you to expand your vocabulary and improve your grammar structure. In order to truly improve your English skills (or any language) you have to USE the language. Produce it. Construct sentences using the vocabulary and grammar that you have previously learned. Only reading things isn’t going to get you to the next level, you must get involved with using the language. Making mistakes is all part of the learning process. Nobody likes to make mistakes, but you just have to try! Reply to one of my tweets and if your sentence isn’t correct, I will correct it and then you will have learned from your mistake. If you don’t try, you’ll never know if you are ‘doing it right’. This is a very common mistake for language learners, they don’t try because they are embarrassed and therefore, never progress. There is no cost involved when you are practicing on Twitter or other social media platforms. Take advantage of the tweets I send out and use them to improve your English skills and accomplish your goals.